We've earlier enjoyed a few books by Duckbill publishers, and reviewed them here and here. So when we were approached by them to do a pre-publication review, for Flat-track Bullies, Arundhati and I were happy to do it. We both decided to review it separately, so as to give our readers two different points of view. Ravi Venkatesan is your regular 11 year old, poised on the brink of a summer vacation and middle school, mostly in that order. The summer vacation looks promising, mostly to Ravi’s middle class, Tambrahm parents, who have enrolled him in a number of classes that they hope will add value to him, and keep him occupied in useful activities. As part of this busy-ness, Ravi has been handed a notebook, in which he has to write every day, as an exercise in improving his handwriting. It is too much to expect, though, for the boy to meekly fill the book with boring copywriting. Ravi decides to use the notebook as a diary, recording all his escapades with sufficient fruity swear words – he knows his mother very well; she was not likely to read too deeply into it, not if he wrote regularly like a good boy. It is now that Ravi really comes into his own. We come to know his innermost thoughts, in glorious technicolour, and the true extent to which he would go to satisfy his inner truant. Misquoting from a famous Bollywood film (the mention of which would not be out of place in this particular review), the story of Ravi Venkat’s summer vacation is brim-full of drama, tragedy and general masala. But, again, misquoting from another Bollywood film (which is referred to in the book), all is well at the end. The book begins well, and Ravi’s turn of phrase keeps you laughing. Somewhere around page 150, though, the jokes get a bit tedious, as one wonders if this is going to continue in the same vein throughout, but then the tide deftly turns, as we hurtle towards the climax with Ravi and his cronies - Sures, Durai and Anto, and the IIT class twosome, Ramesh and Shweta. There could have been less of the not-so-blatant stereotyping, and some tighter editing at parts, that would have made this book by Duckbill publishers even more enjoyable than it is. A well written (sort of) coming-of-age book where we end up applauding and coming to a place of grudging admiration for its protagonist. I can imagine countless tween readers laughing their way through it, identifying very well with the escapades and thoughts of the characters. All is well. The book begins with a fountain pen fight on the last day of school. A tribute to R.K. Narayan? Ravi (the protagonist) and I have a lot in common - from our last names to being brought up on the dictum that whether you are a lion or a gazelle, if you value your life, you’d better outrun the other. The author nonchalantly takes a dig at all the ridiculous things grown-ups propagate, from superstition to ruthless ambition. I enjoyed the self-deprecating humour and matter-of-fact way in which Ravi delivers life lessons. Brutally and refreshingly honest. Daily, I hang from the window grill a full thirty minutes. Maybe if dad had done this exercise when he was young he would have grown tall, then I wouldn’t have to suffer now hanging from the crazy window grill. Okay, at least my kid need not hang from the window as I am doing all the hard work. He will be born tall. The language is not exactly Queen’s English and yet, it is well-written. The book made an impact on many levels. It brought back childhood memories ... As a parent, it made me introspect ... And as a writer, I was amazed by what the author has managed to pull off. Ravi’s irreverence for authority and his interactions with his grandparents, Shweta and Ramesh at IIT coaching, with driver Raja and with Durai and cronies – it is all very real. These could be people I know! Balaji has captured it all beautifully. One could argue that there are stereotypes – I wonder if the author made a choice between stilted and stereotypical and chose the latter? Somewhere along the way, I began to think, 'it is original and really funny, but where is it going from here?' That is when Balaji surprised me and elevated it to more than just an entertainer. I was blown away by the transition from funny to hard-hitting. Balaji breaks all the rules and definitions of writing well... and goes on to write really well. Powerful and unconventional. By the time I’d reached the last page, I was sufficiently impressed to declare ‘Flat-Track Bullies’ a thought-provoking coming-of-age story. 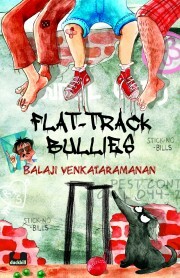 The term 'flat track bullies' always brings to mind the game of cricket. And surprisingly, both of you have not mentioned it. Hi Sandhya and Arundhati, I enjoyed your review. Many of the books nowadays hover on the fringes of stereotypes, whether it is deliberate or accidental one never knows. And to be honest most of the books can do with a tight editing. Enjoyed both the reviews!! Will look forward to the book when it comes out. The book sounds interesting and Arundhati - Balaji seems to have picked that from my head - as a child I used to pester my Nani and tell her she should have exercised better then my mom would've been taller and therefore me. She found the idea hilarious of course!